The line between life and death can become extremely thin. 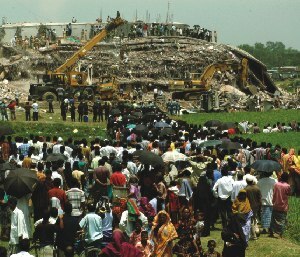 On that Sunday night in Savar, the first few minutes after the nine-storied building caved in and became a huge heap of rubble were the most crucial. Perhaps the ones who died immediately were the luckier ones. At least it was better than being battered and bleeding and waiting for a death that would inevitably follow. In that virtual grave, time goes slow, very slow. Many of the badly bruised who over the first few minutes have held fast onto life finally give in to Death's call. Those who finally escaped that horrific ordeal will have to live with the memory of being trapped under concrete with fellow workers dead or dying, with little hope of ever seeing the open sky again.